We’ve all heard of six degrees of separation. The idea, proven through the research of Stanley Milgram, is that any one person is connected to another through 6 or less other individuals. (If you’d like to see this idea in action, play Six Degrees of Kevin Bacon where you can find if any actor is connected to Mr. Bacon through 6 degrees or less). But to how many degrees of separation does one person influence others? Here’s a hint. It’s not 6. As educators in the social media space, we talk to our students about online influence and the great powers that thought leaders can have to diffuse ideas or realize the adoption of those ideas among social networks. But, while important, talking this way is in a sense, shortsighted. We know that ideas spread not simply in a two-step flow, a la Paul Lazarsfeld’s groundbreaking research (way before Facebook! ), but through a multi-step flow (or, later, diffusion of innovations) through a network of connected individuals. The book Connected: How Your Friends’ Friends’ Friends Affect Everything You Feel, Think, and Do by Christakis & Fowler is a fascinating exploration of the role of social networks in the spread of everything from happiness, to perceived value in the marketplace, to sexually transmitted diseases, to my favorite example: la ola (the wave) at sports games. But it is not simply ideas or diseases that spread. Who we are connected to has many subtle yet powerful influences on our lives: from who we marry, to how quickly we solve problems, to whether or not we’ll vote, to why we would act altruistically at the expense of ourselves, to why men benefit more from a marriage than women, to much, much more. And that is the central thesis to the book. While we like to think of ourselves as independent and autonomous, Christakis & Fowler take a sledgehammer to that notion. We are, as the authors put it, Homo dictyous (“network man”). Interest in social network analysis is on the rise in communication scholarship. Recent years have witnessed a growth in the analysis of large data sets of social media data (e.g., big data) to understand connections and the spread of ideas. As I’ve said before on this blog, this is an area I personally need to delve deeper into. And, I believe that’s true for all of us aiming to teach our students to thrive in the social media economy. Strategic insights can be gained by understanding social networks and we’re seeing a greater emphasis on that both in research and in professional applications. Should You and Your students read Connected? The book is a thorough and accessible look at social network theories and research. While this isn’t a ‘must read book’ like Made to Stick, I would suggest this book to anyone as we all live in a networked world. The book has given me a much greater appreciation for my place within the different social networks I’m apart of. It’s been one of my favorite reads of late. and I absolutely recommend it. Educators and scholars interested in a deeper appreciation for social networks would enjoy and truly benefit from reading this booth. Should students read this book? This is a very readable, incredibly informative and sometimes humorous read that I believe students would enjoy. I would love to have my students read this book. However, I likely won’t use the book in my classes – at least for the classes I currently teach – simply because there are too many other books I want my students to read. But, this book would be great for any class specifically about social networks and more broadly for theory classes. 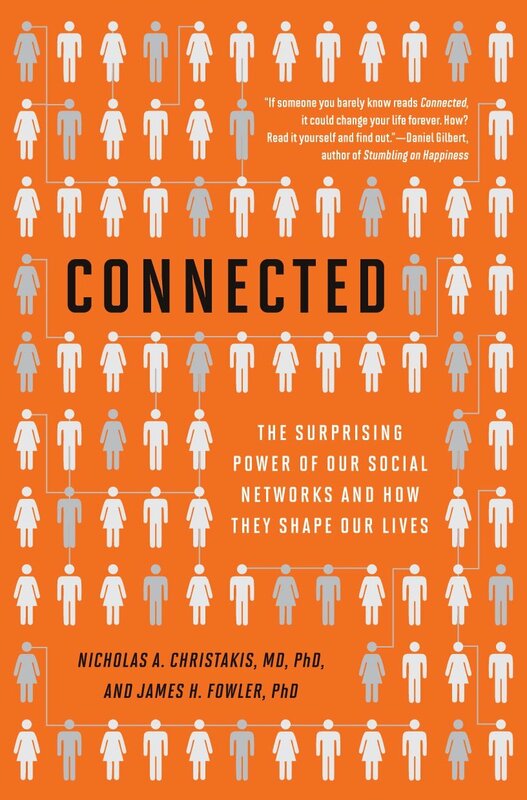 It would be a great read to add to a data analytic course exploring online social networks. Though the book is primarily about offline social networks with a chapter dedicated to online networks, Connected could be used as a suggested or supplementary reading in a social media class if the professor wants sufficient time or depth given to social networks (see my lecture and activity on social networks for my Social Media class). So back to our initial question. While we all may be connected by about three degrees of separation, through how many degrees does one have influence on another? The authors’ research indicates that influence generally travels three degrees. They state: “Everything we do or say tends to ripple through our network, having an impact on friends (one degree,” our friends’ friends (two degrees), and even our friends’ friends’ friends (three degrees)…. Likewise, we are influenced by friends within three degrees but generally not by those beyond” (p. 28). Which begs the question: How are you influencing your friends’ friends’ friends?